Other Common Names: Dyer’s madder, ground-madder, robbia, wild madder, Indian madder, Krapp (Norwegian), rubia (Spanish), garance (French), Färberkrapp (German). Plant Description: Madder is a perennial climbing plant that belongs to the coffee family (Rubiaceae). 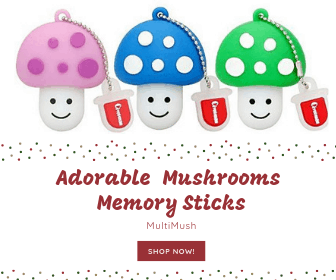 It can grow up to 1.5 m in height and has reddish-brown, fleshy, creeping and richly branched rhizome. The leaves are approximately 8 cm long, lanceolate and evergreen. The plant climbs with tiny hooks found on the leaves and stems. 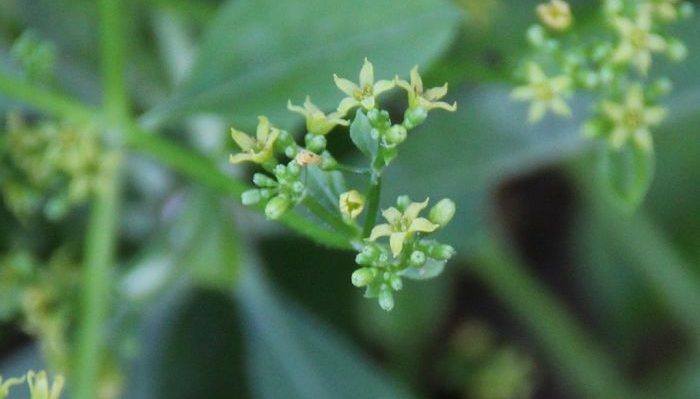 The flowers are small (2–5 mm across) yellow-green with a hint of white, star-shaped with five petals. The flowering occurs from June to August and soon followed by round, red-purple berries. Plant Parts Used: The roots (rhizomes) and sometimes the leaves. Madder has primarily been used for dyeing, but it has also been used as a medicinal herb. The red-colored rhizomes and roots are the source of red dyes known as rose madder and Turkey red. The roots are harvested in autumn after the aerial parts have withered from plants that are at least three years old, as aged plants contain most dye. The main substances found in the root are anthraquinone glycosides (ruberythric acid which decomposes to alizarin, lucidin, pseudopurpurin, xanthopurpurin, purpurin, and rubiadin). Also present in the root are iridoid (asperulosid), organic acids, tannins, calcium, pectin, and sugars. The medicinal properties of the plant are mainly due to the glycosides. Madder has been mentioned more than few times in the ancient medical literature. Hippocrates (ca. 460-377 BC) used the herb as an expectorant remedy and against various gynecological diseases. Additionally, it was listed as an astringent and diuretic agent as a remedy for anemia, an application that certainly stems from the plant’s dye red color (signature doctrine). 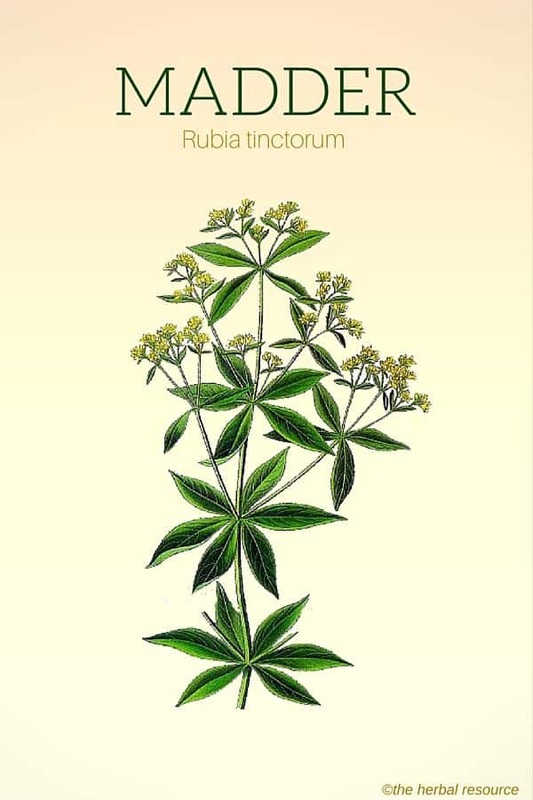 Pliny (23-79 AD) used madder as a cure for jaundice and the plant is mentioned in scriptures from Schola Medica Salernitana, the world’s first medical school. Madder is probably best known for its application in powder or extract form to treat kidney and bladder disorders and some clinical studies have been made with positive results on the herb’s ability to dissolving kidney and bladder stones. In addition, to be apparently effective in dissolving kidney and bladder stones, the herb seems to have an antispasmodic effect on ureters which makes the remnants of the stones pass with more ease. It is also believed that the herb may inhibit the formation of kidney and bladder stone because the ruberythric acid found in the plant forms connections between the calcium and magnesium ions, thus lowering the concentration of these ions in the urine. Besides the herb’s uses as a remedy for kidney stones, it is not used much in modern-day herbal medicine. But once it was used as folk medicine for dropsy and jaundice and herbal tea of the leaves and stems were used to treat constipation. Furthermore, madder was used traditionally as a topical remedy for sciatica. In homeopathy, a tincture made from the fresh roots was used for delayed or missed menstrual periods, disorders of the spleen and various other ailments. Madder has been used since ancient times as a dye plant. Both the roots and leaves give red color, but it was mostly the roots that were used to obtain the dye. The plant contains two primary colorants, purpurin which provides a clear and warm red color red, and alizarin which gives more yellowish red color. When madder was still used as herbal medicine, the recommended dosage was 1-2 g of the dried and finely cut root in 1 cup of boiling water taken 3 to 4 times daily. Based on animal studies it is believed that the substance anthranoid found in madder (especially the substance lucidin) can have mutagenic and carcinogenic effects. Whether these substances are harmful to humans when they occur naturally in whole plant preparations is not certain. Because of these possible toxic effects, the plant is no longer used much in herbal medicine, and commercial products intended for medicinal use which contain the herb are banned or restricted in many countries. Bown, Deni: The Royal Horticultural Society New Encyclopedia of Herbs & Their Uses. London, Dorling Kindersley- 2002. Karalliedde. L. and Gawarammana. I.: Traditional Herbal Medicines. Hammersmith Press Limited. 2007. Buchanan. R.: A Weavers Garden. Dover Publications. 1999. Weiss, Rudolf Fritz: Herbal Medicine. Göteborg, AB Arcanum. 1988. Williamson, Elisabeth M.: Potter’s Herbal Cyclopaedia. Essex, Saffron Walden. 2003.